In acknowledgement of National School Choice Week, the following evaluates North Carolina’s public charter school option. What are public charter schools? What is their academic record? Who are their students? Information compiled directly from North Carolina Department of Public Instruction test data shows that the state End-of-Grade (EOG) test performance average of public charter students is higher than that of traditional public students, and that in 10 of 12 demographic subgroups— including minorities, economically disadvantaged students, and students with disabilities— students at public charter schools academically outperform students at traditional public schools on EOG tests. So, what are public charter schools? Public charters schools are entirely tuition-free and accept all students regardless of address, income, or ability. Unlike traditional public schools, public charter schools have the freedom to select their own curriculum or educational focus instead of the state-mandated curriculum, which in North Carolina, is Common Core. Many public charter schools offer unique programs such as STEM, Montessori, Classical, Immersion, etc. Also unlike traditional public schools, public charter schools do not limit their enrollment to an attendance zone. This means that any student may enroll in a local public charter school regardless of address. Approximately 82,000 NC students are enrolled in public charter schools this year. 100% of public charter school enrollment is the result of voluntary parent choice. A January 2016 report by NCDPI demonstrates that in four of six racial categories, public charter schools serve a higher percentage of these students than do traditional public schools. Further, the following data will present NC student performance averages in all demographic categories for both public charter schools and traditional public schools. 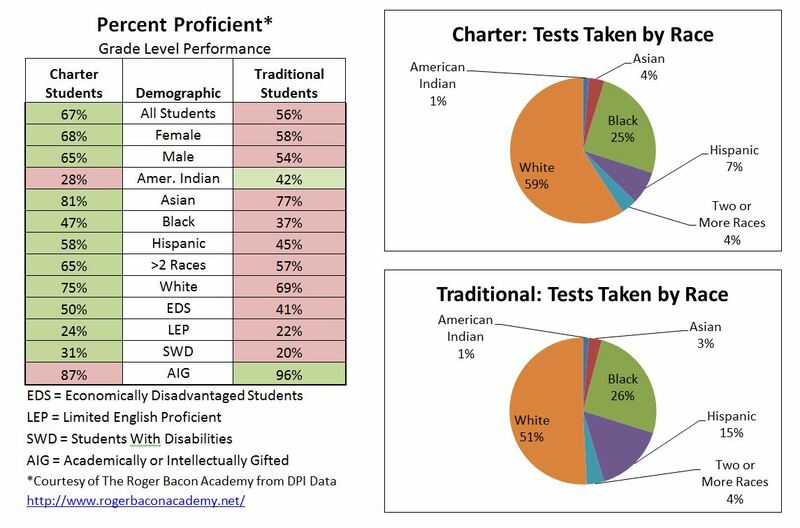 In 10 out of 12 demographic subgroups— including minorities, economically disadvantaged students, and students with disabilities— students at public charter schools academically outperform students at traditional public schools on EOG tests. Among other things, the data reveal that the EOG performance average of Hispanic students in public charter schools is 58% compared to 45% in traditional public schools. For black students, the charter average is 47% compared to the traditional public school average of 37%. The charter average for students with disabilities is 31% compared to the traditional public school average of 20%. Economically disadvantaged students also performed better in public charter schools, at a rate of 50% compared to 41% in traditional public schools. The performance average comparisons for each of the 12 demographic subgroups are provided in the table below. So, are charter schools a good option for NC students? NCDPI testing data confirm, “Yes!” In addition to public charter schools outperforming traditional public schools on EOG tests by nearly ten percentage points, the data presented below demonstrate that 10 of 12 student groups have more academic success at public charter schools than do their peers at traditional public schools. The Alliance gratefully acknowledges Sawyer Batten of The Roger Bacon Academy (RBA) for her suggestion to calculate the performance percentage of public charter school students as a component of the total state performance percentage and to Baker Mitchell, Founder of RBA, for extracting and displaying these results. Both individuals currently serve on the Board of Directors of the Alliance. This entry was posted in Education - K-12, Learning and Education, Politics - NC, Politics - US, Uncategorized and tagged Baker mitchell, charter day school, charter schools, elementary education, eog scores, K12, parental choice, roger bacon academy, Sawyer Batten, teaching. Bookmark the permalink. Thanks for the reply. That makes sense. My 2nd grader is is in a new charter school in Greenville, NC and there is no established AIG here, yet. I guess that would also account for why some charter schools are doing better in the other areas, since many of the students who would be AIG in traditional public schools are mixed in with non-AIG in charter schools. It is nice to hear some good comments about charter schools. This article was focus directly on student academics & I appreciate that. So many other articles on charter schools have been focusing on how they are taking all of the money away from public schools. I appreciate you posting this. “…the students who would be AIG in traditional public schools are mixed in with non-AIG in charter schools.” Actually, the bottom four categories – EDS, LEP, SWD, and AIG are not mutually exclusive with other categories. That is the test results for an Asian, female, EDS AIG student will show up in each of these groups. Perhaps of greater significance is that because charters operate on much lower per-pupil funding, they usually must have larger classes in these specialized courses to defray teacher and classroom fixed costs. Thus I might speculate that if a charter does decide to have an officially recognized AIG program, they may not have quite as high a threshold for admittance to the program to ensure enough students to defray its costs. I am interested why only 87% of “AIG” in charter schools is ranked as “proficient”. I would think that almost all of these students would be proficient at, or above, their current grade level. Would that indicate that most charter schools are good at bringing lower and average students up but not helping the gifted excel? Just wondering your take on that and what some charter schools are doing for AIG success. Thanks! As for the AIG (Academically or Intellectually Gifted) category, few charters formalize their advanced classes into an officially sanctioned AIG program because of the extensive record-keeping and auditing required. They just offer the advanced classes. Only 5.1% of charter tests were by officially recognized AIG students, while 16.2% of tests by traditional students were by officially recognized AIG students.